Sometimes you just want quiche. It's a Sunday morning standard but lots of people think it too much work, too temperamental and don't bother. That's a shame. If you follow me at all you know you must always make the $1.29 investment on a weekly basis and have a box of pre-made, rolled, pastry in your fridge. You must have it there at all times. No, really, you must. If they're on sale, buy more and toss them into the freezer. There is never going to be a time we can't whip up a pie, quiche or treatie for lack of desire to make pie dough. My mother, as I say this, will be horrified but sometimes we need to stray from the straight and narrow and have boxed dough at the ready. Sure, we can make pastry but sometimes, the need for quiche surpasses any desire or gumption to actually make the pastry and then wait the 30 to let it set and all the flour and rolling pin and other accouterments that come with a fine bout of pastry making. Today we go to the fridge, we grab the box and we are content with that. Let's begin. Take your pre-rolled pastry out of the fridge, let it sit there and soften enough to unroll. *on a Sunday morning that is happily the extent of my pastry involvement. Fry some bacon, 6 slices, until crisp. 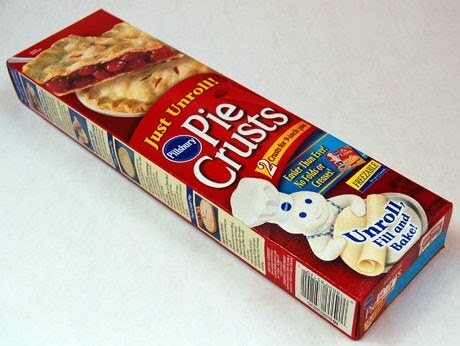 Search through your fridge for anything left over that you can chop up and sprinkle in an even layer in the pie shell. ANYthing works here. I've made it with taco meat and crumbled tortilla chips and cheese, really, search around and find any combination of food you like, it'll work. My search today left me with a small pile of chopped ham, some cheese; Havarti, cheddar and Parmesan, a few sick cherry tomatoes, 2 spring onions, 3 small boiled potatoes. That works. By the time the bacon is crisp (remember to drain the fat into a jar! everything you make will taste better!) and the fridge search complete, the pastry has relaxed enough and we're ready to go. Preheat the oven to 375. This morning, I rolled out the pie dough slightly so that I felt as though I'd participated in the process but really you don't have to. I lined my pie plate and set it to one side. I chopped small each of my delicious finds from the fridge. I sprinkled each in the bottom of the pie shell, in an even layer. Don't make your layers too thick otherwise you'll run out of space and that's never good. I layered my crisp bacon then spring onions then tomato. Then the chopped ham, ripped Havarti, grated Parmesan and I had some Lancashire cheddar. I chopped the potatoes small and again, a sparse single layer. 1 cup of milk. Wisk heartily! herbs you have and like. I found some almost done parsley in the fridge which I chopped fine and some dry herbs de Provence. Pour the egg mixture over the filling and put it in the lower rack of the oven for 25 minutes. Move the quiche to the upper rack (it's a me thing but I always do this) for another 15 or so until it's beautiful, puffy and a knife comes out clean. Put it on a rack to cool down, slice and eat! Really, no fuss, no muss and it's absolutely delicious. Also, your fridge is now organized and ready for you to fill up with left overs this week so we can have a completely different quiche next week... brisket and pepper jack perhaps?